* Note De Luxe starts as a sweet floral bomb. Actually, the first whiff has a touch of citrus, but that is quickly overpowered by iris, violet, jasmine, and something mysterious that resonates as slightly dirty. * While it’s quite well-blended, I had to sniff my arm several times to figure out the flowers each time. * Note De Luxe is also quite loud. This could be Flowerbomb’s French second cousin. * The flowers sing for a long time, projecting for a good two hours before they calm down a little. * After about six hours, it settles down to a nice oriental base – with vanilla, tonka, and resins. Summary: Evody is a niche line made by a mother/daughter team who make really special and high-quality perfumes.When I sniffed the full line in Paris, I found it hard to decide which one I wanted as they are all pretty DIVA. Though I say DIVA, I am not saying that guys can’t wear Note De Luxe, just that they would have to be comfortable broadcasting something different and distinctive. These scents are not for the meek of heart nor for the shy wall flower. Note de Luxe is a strong floral oriental with excellent longevity, around twelve hours. Obviously, it isn’t office-friendly, but it is perfect for nighttime. I was struck by how well-blended the scent was (it was hard to place each note – even after several wearings) and that it smelled really expensive as if they used very high quality ingredients. If you want something vivid and bold that will make you stand out from the crowd, sample Note de Luxe. 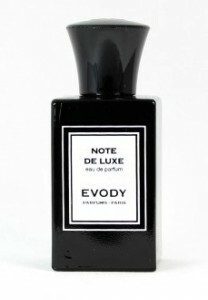 Evody fragrances are available at Jovoy and Sens Unique. Disclaimer: No disclaimer needed as I own a full bottle. Image courtesy of Jovoy.